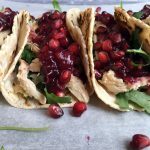 This recipe for Histamine Friendly Pulled Turkey and Cranberry Sauce Tacos with Grain Free Tortillas, is very much inspired by the brilliant Leanne from Crumb Top Baking and her recipe for Slow Cooker Apple Cranberry Chicken Tacos. When I saw her tacos on Instagram, I was sold immediately! And I knew I had to make my own version of these Tacos 🙂 I changed a few things according to my taste, and made it more histamine friendly. 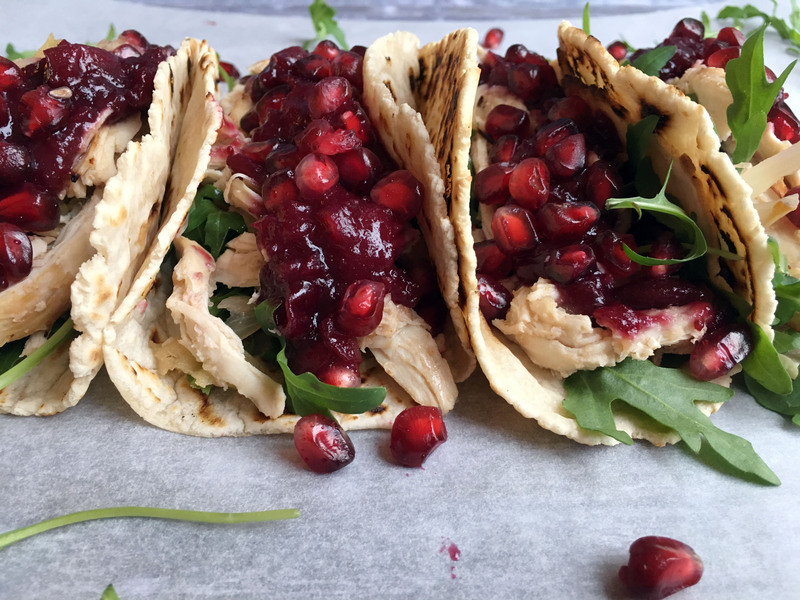 So here they are, Pulled Turkey and Cranberry Sauce Tacos with Grain Free Tortillas – a real Low Histamine feast \o/. 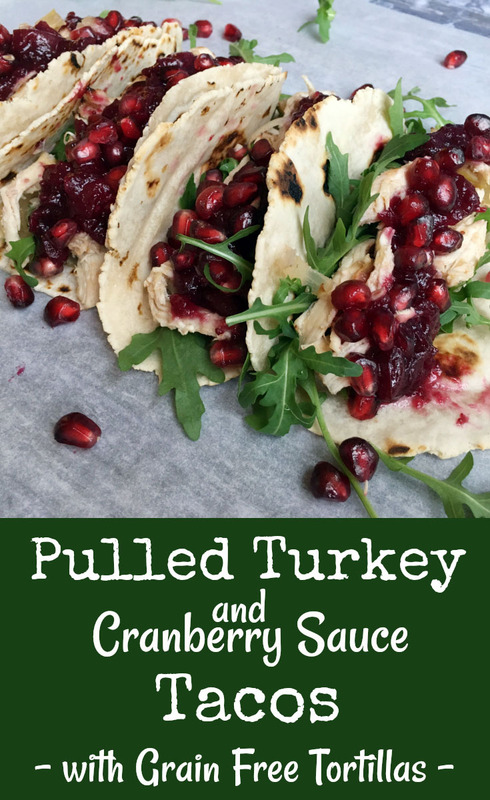 These Histamine Friendly Pulled Turkey with Cranberry Sauce Tacos are a perfect taste combination! I had cranberry sauce for the first time last year, and I have been hooked ever since!!! So when the fresh cranberries showed up in the stores here this fall – I was like: Wuhuuu finally \o/ There is just something about the autumn that and the produce belonging to this season that really gets my creative juices flowing. And if you have a ton of leftovers the day after thanksgiving, just take that turkey and give it a quick broil in the oven, fill up you tacos, add some greens and some cranberry sauce 😀 Now that we are on the topic of leftovers. For some people with histamine intolerance, any leftovers can be like poison. But for most, it is a bit more of a gradient issue. In the beginning I was able to eat leftovers from dinner for breakfast or lunch the next day, but no later than that. Now I’m okay with leftovers up to 48 hours old (I haven’t tried to eat anything older than that yet). If you are nervous about it, freeze down the left overs in handy portion sizes. Now for the recipe, I make my pulled turkey in the oven in an oven dish with a lid. I guess it is sort of a simple kind of dutch oven. This brings down the cooking time significantly, making it a bit more histamine friendly 😉 If you have an instapot/pressure cooker you can bring down the cooking time even more. First, place the turkey breasts in a pan together with a little oil, brown both sides of the turkey breasts. 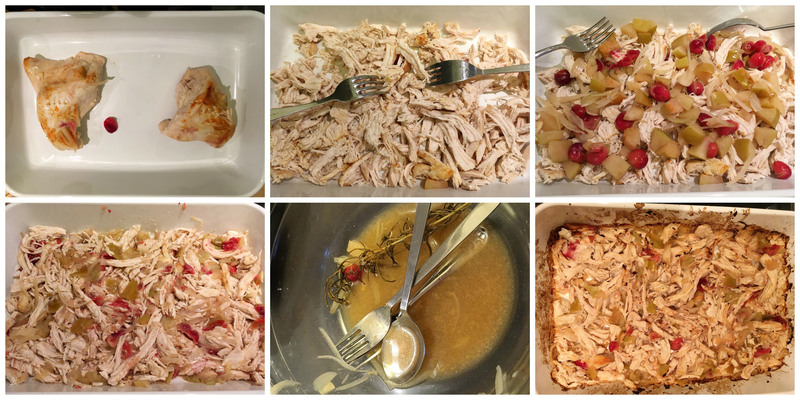 Then place the turkey breasts in a dutch oven (oven proof dish with a lid), together with a sliced up shallot, a diced apple, cranberries, bone broth, apple juice, rosemary, apple cider vinegar, salt and a bit of sweet paprika. Put the lid on and place the dutch oven in the oven at 150 °C (300 °F), and let it cook for 1 1/2 hour. While the turkey is cooking away in the oven, it is time to make your tortillas. 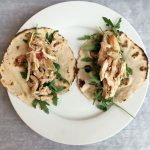 I make grain free tortillas from cassava flour, following the recipe for Paleo Tortilla’s 2.0 (Nut Free/Gluten Free/Dairy Free) by “Nurture My Gut”. 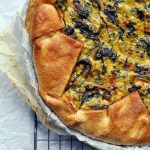 This step is of course completely optional, and if you are not in the mood for making your own tortillas feel free to use any ready made and tolerated tortilla/taco shells you like 🙂 But if you have been struggling with finding something grain free and low histamine, this is a great recipe. 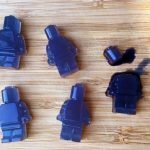 And they are really easy to make, once you get the hang of it. For making the grain free tortillas simple mix your dry ingredients well together in a bowl. Then mix your wet ingredients in a separate bowl, and add them to your dry ingredients. Mix well til you have a formed a ball of dough that doesn’t stick to your hand. Divide the dough into 12 small dough balls, and keep them in an air tight container. Roll out each ball to a thin round sheet and bake each sheet individually on a dry pan, until air pockets starts to form. Flip and back on the other side as well. This step goes really quick! So be aware of them not burning, you do want them to form brown spots. For a more detailed description see the recipe by “Nuture My Gut”. When the turkey is done take it out of the oven, and let it cool down slightly so that it is easier for you to handle. Turn up the temperature of the oven to 250 °C (480 °F). While you let the turkey cool down a bit get the cranberry sauce started. I make my cranberry sauce with cranberries and blueberries, but if that sounds like total blaspheme to you, feel free to swab out the blueberries for more cranberries. Place the cranberries (I used fresh) and blueberries (I used frozen) in a pot, add apple juice, honey and a little of the cooking liquid from the turkey. Bring it to a boil, and let it cook without a lid, until the sauce has thickened and their are no more whole berries left. Stir occasionally, so that it doesn’t burn. While the cranberry sauce is cooking away. Place the turkey breasts is a big oven proof dish. Shred the meat with two forks, add all the onion, apple and cranberries and mash it all up. Add 2-4 tbsp of the cooking liquid and mix it all up. Place it all back into the oven and broil it for 5-10 minutes. Stir midway, so that the edges doesn’t blacken. 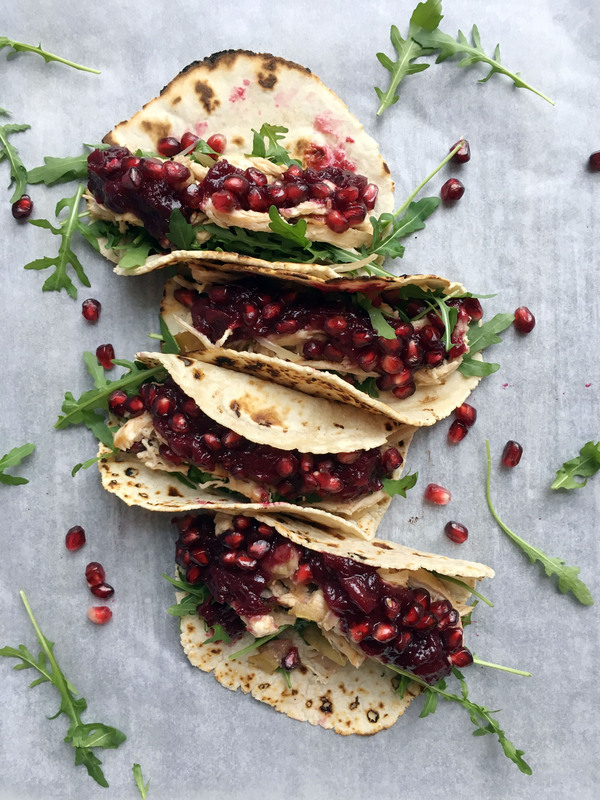 I like to eat these tacos whit some arugula (for some green and bitterness) and some pomegranates (for its anti inflammatory properties, crunchiness and general prettiness). Now all there is left is to fill up those tacos and dig in! Totally YUMMY!!!!!! 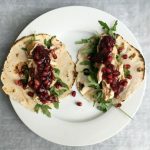 These epic Histamine Friendly “Pulled Turkey and Cranberry Sauce Tacos” are absolutely Yummy o/ Served with arugula and pomegranates in homemade grain free soft tortillas. A real Low Histamine Feast! First, place the turkey breasts in a pan together with a little oil, brown both sides of the turkey breasts. 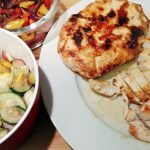 Then place the turkey breasts in a dutch oven (oven proof dish with a lid), together with a sliced up shallot, a diced apple, cranberries, bone broth, apple juice, rosemary, apple cider vinegar, salt and a bit of sweet paprika. Put the lid on and place the dutch oven in the oven at 150 °C (300 °F), and let it cook for 1 1/2 hour. While the turkey is cooking, it is time to make your tortillas. This step is of course completely optional, and you can use store bought soft tortillas or a salad leaf if you prefer. Start by mixing the dry ingredients well together in a bowl. Then mix your wet ingredients in a separate bowl, and add them to your dry ingredients. Mix well til you have a formed a ball of dough that doesn’t stick to your hand. Divide the dough into 12 small dough balls, and keep them in an air tight container. Roll out each ball to a thin round sheet and bake each sheet individually on a dry pan, until air pockets starts to form. Flip and back on the other side as well. This step goes really quick! So be aware of them not burning, you do want them to form brown spots. For a more detailed description see the recipe by “Nuture My Gut”. When the turkey is done take it out of the oven, and let it cool down slightly so that it is easier for you to handle. Turn up the temperature of the oven to 250 °C (480 °F). While you let the turkey cool down a bit get the cranberry sauce started. Place the cranberries and blueberries in a pot, add apple juice, honey and a little of the cooking liquid from the turkey. Bring it to a boil, and let it cook without a lid, until the sauce has thickened and their are no more whole berries left. Stir occasionally, so that it doesn’t burn. Place the turkey breasts is a big oven proof dish. Shred the meat with two forks, add all the onion, apple pieces and cranberries and mash it all up. Add 2-4 tbsp of the cooking liquid and mix it all up. Place it all back into the oven and broil it for 5-10 minutes at 250 °C (480 °F). Stir midway, so that the edges doesn’t blacken. Serve them up with some arugula and pomegranates. 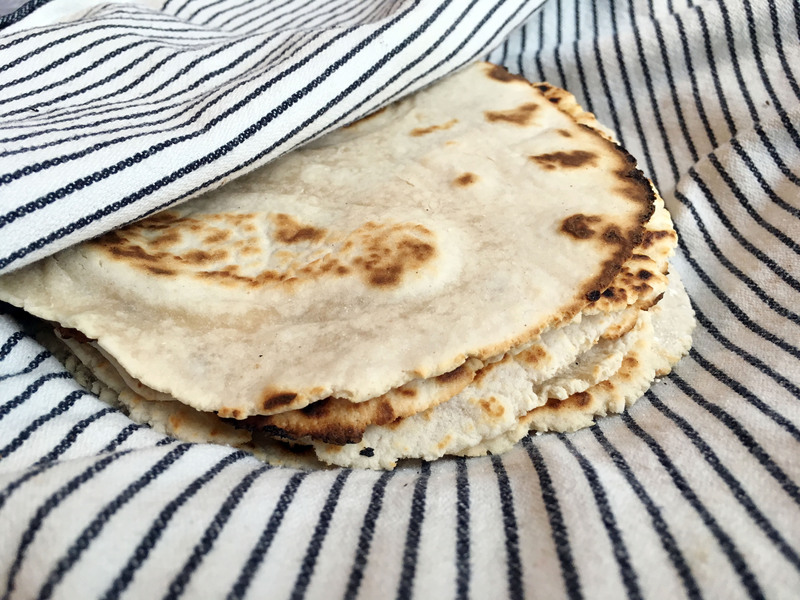 The recipe for grain free tortillas makes 12 small or 8 medium soft tortillas, you can freeze down any leftover tortillas. 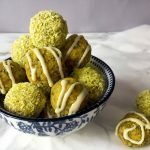 These look absolutely amazing Tania! 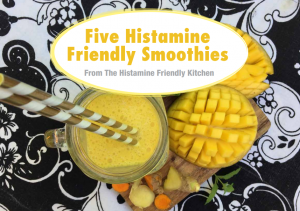 Love the changes and additions you made to make this recipe more histamine friendly. 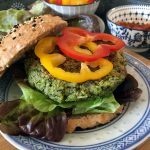 I’m sure to have leftover turkey over the holidays, so I’m definitely trying a version of this recipe, especially the grain-free tortillas. I’ve never cooked with cassava flour before, so that will be an experiment! Also loving how colorful and vibrant these look! The addition of pomegranates is a great idea!